No app is an island, especially not in today's network computing environment. Applications that had operated separately are now bound in tightly integrated suites. A case in point: Workflow and imaging software, once relative strangers, now are often found together under the document management umbrella. The rise of enterprise computing and the rapid growth of electronic commerce are giving the document management paradigm a face-lift. Instead of a jumble of loosely connected programs, the latest document management software packages are built around client-server architectures running Microsoft Windows NT or Unix. Most comprise a core program loaded on the server with the addition of other service modules, including workflow and imaging. By any name, document management is a sizable industry. A recent report by the Association for Information and Image Management International of Silver Spring, Md., predicts that overall spending for document management will reach $22.7 billion this year and increase to $41.5 billion by 2003'a combined compound annual growth rate of 26 percent. 'Integrated workflow and imaging components are sophisticated enough for most users. 'Don't buy a client-server program unless it's Web-enabled. 'New terms such as knowledge management don't change the bottom-line goals of document management. 'Client-side software can take up lots of memory. 'Insist on log-on and password systems with multiple levels of security. Spending for enterprise and production workflow components will amount to $4.3 billion this year and rise to $8.3 billion by 2003, while spending for various imaging components will range from $8.4 billion to $11.4 billion during the same time period, the AIIM report projects. At its simplest, document management automates the process of filing and retrieving diverse word processing files, computer-aided design and manufacturing documents, spreadsheets, scanned images, and other documents. The idea is to make them available in ways that are the most beneficial to the largest number of users. Workflow systems, as a part of the process, streamline the time-consuming tasks associated with traditional paper-based document flow and free people for more productive tasks. Imaging systems use scanners, cameras, printers and computers to convert paper documents into electronic images to simplify their management and movement within a group. Other components, such as computer output to laser disk (COLD), optical character recognition (OCR) and intelligent character recognition (ICR) modules, can be added to great advantage. The potential payoff from integrated programs is substantial; most organizations using them benefit from reduced administrative costs, quick return on investments, more efficient use of personnel and the ability to turn unrelated data into usable information'that is, knowledge. This Buyers Guide features integrated suites that contain both workflow and imaging components. Most also include COLD, OCR, ICR, text retrieval and other integrated modules. All but one are client-server systems that operate under Windows 9x, NT, Unix or Unix variants, with Windows 9x the most common client platform. The exception is Archive Power System Inc.'s Power Professional 1.5, a standalone desktop PC system. Also, Blueridge Technologies offers a free single-user version of its Optix 5.4, which is downloadable from the company's Web site. Just about every product listed here provides its own database or uses a third-party database system such as Microsoft SQL Server for document storage and retrieval. Almost all are Web-enabled so users can search and retrieve documents from their databases from anywhere in the world using only a Web browser. 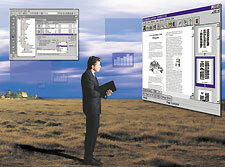 Suites such as Altris Software Inc.'s Altris EB 11.0, Blueridge's Optix 5.4, Feith Systems and Software Inc.'s FDD 5.0, and Highland Technologies Inc.'s HighView 3.04 are fairly straightforward document management systems to which various modules, such as workflow and imaging, are added according to user requirements. Other suites, such as Computer Associates International Inc.'s Raveler 2.0 and ISPA Inc.'s DOCDepot 2.0, contain imaging and workflow components but are targeted more for Web content management than for client-server document management. The push toward e-commerce has spawned a new software category: electronic business process automation. Axonet Inc.'s MegaFlow 3.5, Documentum Inc.'s Documentum 4i and Optika Imaging Systems Inc.'s eMedia 1.5 are in this category. Workflow. Workflow software's main task is to move electronic documents quickly and efficiently along assigned routing paths. The flow of documents is automatic, which results in greater productivity, efficiency and user satisfaction.
' Route planning. Graphical interfaces in most workflow packages let users create complex workflow routes in minutes and modify them on the fly.
' Parallel routing. Documents can be sent along parallel routes for processes that require the attention of several people at once.
' Rules-based routing. Built-in logic governs where documents should go based on their descriptions.
' Check-in/check-out. Users can check documents out to work on them, then check them back in when the work is done.
' Tracking. All documents are accounted for.
' Delegation. When an assigned user is absent, the project manager can designate a substitute to work on a document.
' Saving revisions. Document revisions are tagged and saved accordingly.
' Scripting. All workflow apps are scriptable so that integrating them with other applications is simply a matter of point-and-click.
' Digital signatures. Digital signatures verify that a specific person is approved to access files or documents.
' Monitoring. The workflow software monitors and measures the time it takes to complete a process. Document imaging. Good imaging systems work with popular off-the-shelf software to scan, store and manage thousands or even millions of documents electronically. Whatever form your documents are in'paper, microfilm, slides, X-rays or CAD drawings'they all can be scanned into electronic form. Then they can be indexed according to criteria developed by users. Because most imaging systems support storage technologies such as RAID, optical jukeboxes and CD-ROMs, storage space is virtually unlimited.
' Multiple document support. Users can index, archive, manage, retrieve and control all kinds of files, including word processing files, spreadsheets, databases, graphics, photographs and image files of any type.
' Hyperlinks. Any document in a database can be hyperlinked to any other inside the system'and outside it if the system is Web-enabled.
' Image viewer. The viewers of most imaging systems provide zoom, rotate, annotation, thumbnail and other features to make it easier to see the image from various angles.
' Multiple workstation support. Client-server architectures enable images to be scanned into one workstation and indexed from workstations across the network.
' Annotation and markup. A high-powered imaging component lets users annotate and mark up images. Colored lines and shapes can be drawn on the image without changing the images themselves. Web gateways. Web-enabling software resides on the server in most client-server document management systems. This gives authorized users outside an organization access to any of the documents residing on the system's database via a standard Web browser such as Netscape Navigator or Microsoft Explorer. Electronic document routing via the Web is also possible. Some Web servers, such as I Levy & Associates' Navigator Advantage 2000 Web Server, also can provide a single-source server for Intranet network areas. COLD. Modules such as Blueridge Technologies' Optix COLD let users move mountains of data into long-term storage by writing documents onto CD-ROM disks. Documents are automatically indexed and filtered according to ASCII or image formats, and the system supports optical jukeboxes with capacities ranging from hundreds of gigabytes to terabytes. Users can create scripts that automatically format COLD documents. If a user drags a file from a host computer onto the appropriate script, Optix will automatically format the data for COLD storage. OCR and ICR. Modules such as those in Highland Technologies' HighView OCR can convert image files to text files and let users do searches based on content. Character recognition is specialized image processing that includes features such as noise reduction, which removes stray black marks; line removal, which deletes fixed horizontal and vertical lines before scanning; and image registration, which aligns each image to vertical and horizontal registration points.